SimBionic® 3.0 is an open source software project that makes it possible to specify real-time intelligent software agents quickly, visually, and intuitively by drawing and configuring behavioral transition networks (BTNs). Each BTN is a network of nodes connected by links (connectors)—similar to a flow chart or finite state machine. Visual logic also makes it easy to show, discuss, and verify the behaviors with members of the development team, subject matter experts, and other stakeholders. BTNs are especially effective for developing tactical decision-making modules, real-time reactive planners, and adaptive execution systems which detect, track, and classify complex sequences of events and state conditions and then take appropriate actions. SimBionic software provides three components. The SimBionic Visual IDE (or Editor) application enables developers to specify intelligent agent behaviors by creating and saving BTNs that are read and executed by the SimBionic Run-time System. This run-time software library can be embedded within a Java® software application to query for state information and execute actions, as specified by the BTNs. The SimBionic Visual Debugger application helps developers test and debug behavior logic by stepping through the execution of the BTNs and inspecting the values of local and global variables. Figure 1. 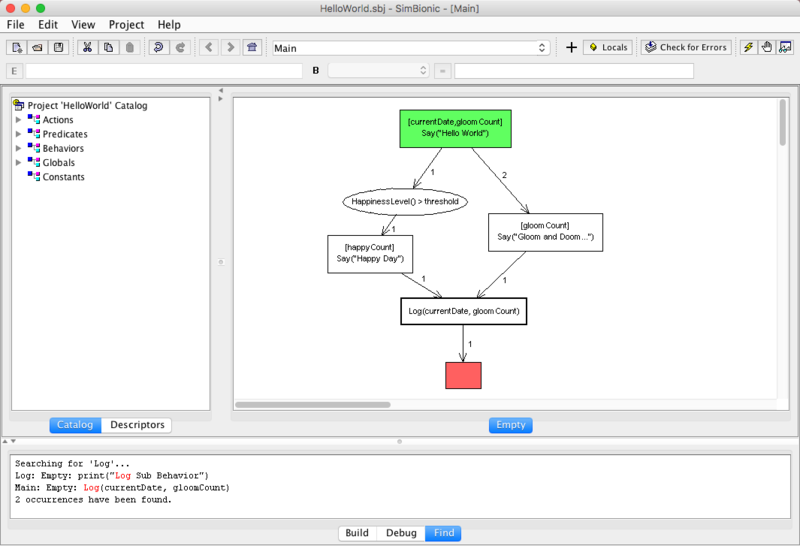 The SimBionic Visual IDE Enables Visual Specification of Intelligent Behaviors. The SimBionic engine controls one or more entities, each executing its own set of BTNs simultaneously. When using SimBionic to develop a game or simulation, different entities might correspond to simulated characters or computer-generated forces, each acting independently. In a decision support system or intelligent training system, each entity could be an expert object that uses its unique knowledge to detect, track, and classify certain types of events or situations, select and present relevant data, and/or make recommendations. SimBionic is an enabling technology for numerous innovative training, simulation, and decision support systems. For example, SimBionic controls simulated characters and assesses student performance in PORTS, a simulator developed by Northrop Grumman for training U.S. Navy tactical action officers at the Surface Warfare Officers School (SWOS) in Rhode Island. SimBionic-controlled intelligent agents, rather than instructors, play the roles of simulated crew members, greatly reducing the need for instructors to conduct effective training. SimBionic also evaluates the TAO students’ performance automatically and infers tactical principles that were or were not applied correctly, so it can coach students during scenarios and provide a detailed report card afterwards. SimBionic was honored with a Brandon Hall Excellence in Learning Award for Innovative Technology. SimBionic also helped Stottler Henke win the prestigious Tibbetts Award, given by the U.S. Small Business Administration. The U.S. Air Force recognized SimBionic® as a successfully transitioned technology developed with Small Business Innovation Research funding. Fu, D., R. Houlette, J. Ludwig (2007) An AI Modeling Tool for Designers and Developers. 2007 IEEE Aerospace Conference Proceedings. Big Sky, Montana, March 4-9, 2007. Fu, D., R. Houlette, R. Jensen, O. Bascara (2003) A Visual, Object-Oriented Approach to Simulation Behavior Authoring. Proceedings of the Industry/Interservice, Training, Simulation & Education Conference (I/ITSEC 2003). Houlette, R., D. Fu, R. Jensen (2003) A Visual Environment for Rapid Behavior Definition. Proceedings of the 2003 Conference on Behavior Representation in Modeling and Simulation, Scottsdale, AZ, 2003. Houlette, R., D. Fu, R. Jensen (2003) Creating an AI Modeling Application for Designers and Developers. Proceedings SPIE. Vol. 5091, AeroSense-2003, Orlando, April 2003. Fu, D., R. Houlette (2002) Putting AI in Entertainment: An AI Authoring Tool for Simulation and Games. IEEE Intelligent Systems. Jul-Aug 2002, 81-84. Fu, D., R. Houlette, O. Bascara (2001) An Authoring Toolkit for Simulation Entities. Proceedings of the Industry/Interservice, Training, Simulation & Education Conference (I/ITSEC 2001). Houlette, R., D. Fu, D. Ross (2001) Towards an AI Behavior Toolkit for Games. In AAAI 2001 Spring Symposium on AI and Interactive Entertainment. To explore how Stottler Henke can help you create smarter simulations contact us.